It's no secret that Adobe Photoshop didn't invent image manipulation. People have been dramatically altering photos since the invention of photography itself. But Photoshop pushed image tinkering into the digital age, and much like other tools of the digital revolution, helped bring photo fakery to the masses. Below we look back at just a few of the photoshops (yes, it's a generic term now, whether Adobe likes it or not) that would become famous and infamous. Does anything look fishy about this image of President George W. Bush? His book might be upside down, but that's all thanks to a little Photoshop trickery. Is that really a CCTV outside George Orwell's famous house? No, it's not. It's from a series of photoshopped works by artist Steve Ullathorne. This "computer of the future" which purports to be from the 1950s is too good to be true. Back in 2007 Fark hosted a photoshop contest, and thanks to the magic of the internet, this one quickly went viral. The only problem? People were soon passing it off as real. Like so many supermoon photos, this one is a fake. I'm no moonologist, but if the moon was really that big on any given night I'm pretty sure we'd all be dead by now. Because tides or something. This photo of Putin-pal Steven Seagal giving bunny ears spread far and wide on social media. And yes, Seagal is buddies with Putin. But those fingers are fake. Certainly makes you wonder what the sly look is all about though. Of all the early 2000s photoshops to go viral, "9-11 guy" is one that sticks out in my mind as particularly shocking. You can tell almost immediately that it was fake, given the bad timestamp. But 9-11 was still so fresh in everyone's minds that the fact anyone would make such a thing was pretty damn shocking. The original story most commonly attached to this photo? It was found on some undeveloped film in the wreckage of the Twin Towers. There are so many photoshops that are simply too good to fact-check. And this "underwater train" is one of them. We wanted to believe that real life was like Harry Potter movie or something. Too bad it's a fake. Election season brings out the photoshops like none other. And, as you can imagine, Obama got more than his fair share of photoshops in both 2008 and 2012. The one that's most interesting is perhaps the most plausible. Obama has been an occasional smoker and struggled to quit. But this photo of him with a cigarette dangling from his mouth is fake. You may have seen this remarkable image of "Buddha" carved in stone. Too bad it's a total fake, created by internet artists. I talked with the creator last year and when I asked about his images that were "clearly photoshopped" he shot back that to him they were all "clearly photoshopped." The photoshopness is clearly in the eye of the beholder. Which brings us to the gif at the top of this post. As you can see, it's not the Northern Lights of Alaska. 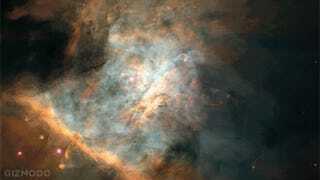 The background is actually a panoramic image of the Orion Nebula, taken from the Hubble telescope. Well done, for sure! But totally fake. So what's your favorite Photoshop of all time? Did any of these fool you when you first saw them?